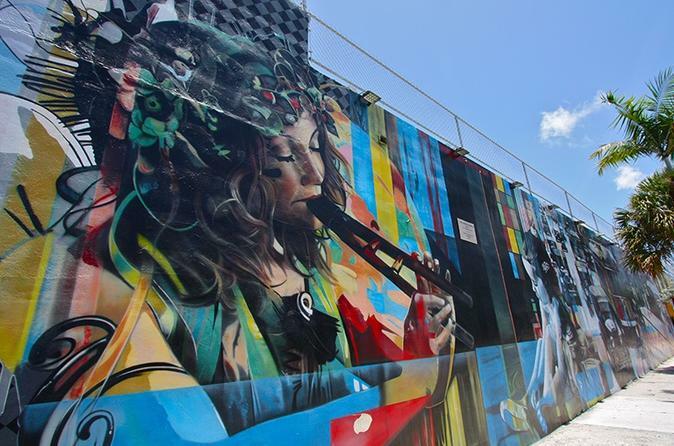 Explore the greater Miami arts district of Wynwood on this guided, 1.5-hour walking tour. Wynwood is home to over 70 art galleries, retail stores, antique shops, eclectic bars, and one of the largest open-air street-art installations in the world. Marvel at the vibrant displays and visit three of the best galleries in the neighborhood. Along the way, learn from an expert guide about the local artists and discover the vision for their work. To begin this fascinating adventure into the South Florida arts scene, arrive at a centrally-located point in Wynwood, Miami. Meet and greet your local guide and the rest of the group, then head down the streets of Miami to begin this 1.5-hour walking tour. While exploring the local terrain, stop to admire several murals. See the works of highly acclaimed street artists like David Walker, Interesni Kaski, and others. Learn about their techniques and stories, and see the metamorphosis from painting individual walls to the transformation of entire buildings. Also, visit three galleries during the tour, including Gregg Shienbaum Fine Art. At this particular gallery, see the works of both modern/contemporary masters and urban/street artists, like Andy Warhol, Shepard Fairey, and many others. Discover the mixture of cultures and the diversity of artistic expression on this outstanding walking tour. Please note: Specific gallery stops, artwork, and murals are subject to change as galleries update shows and hours, and murals are painted over.